This seems a strange addition to the wide world of Masonic ephemera, especially given the recent news and press on guns and gun violence. But is would seem the world wants (needs) a vintage styled rifle branded with icons of the fraternity. 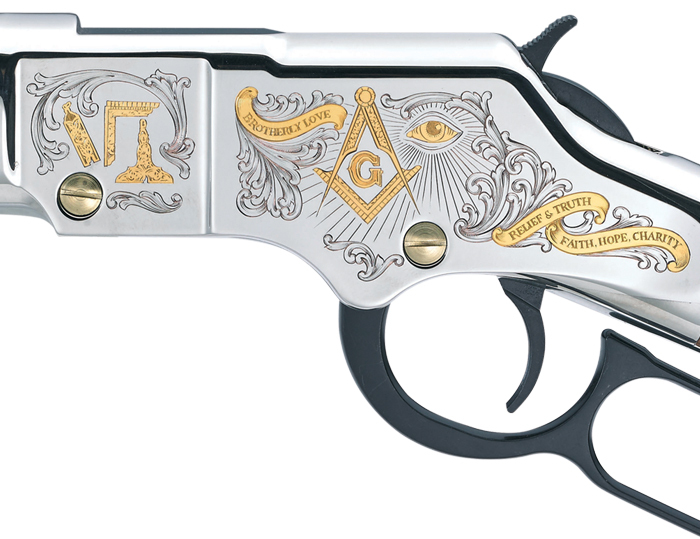 Henry Repeating Arms is pleased to introduce the newest rifle in its collection, The Henry Golden Boy Freemasons Tribute Edition. It recognizes the long history of this honorable fraternal order and rewards the work and dedication of Freemasons everywhere. The rifle is crafted with the highest attention to detail. The select American walnut stock depicts our first President in full Masonic regalia, with apron, trowel, and Warden’s column, standing on a “temple” floor in front of the Masonic staircase, in a painted tableau bordered by scrollwork in the same style as the receiver. The left side carries the famous compass and square retained from the earliest days of Freemasonry, the mason’s plumb and level, the letter “G” which stands for both God and Geometry, the All-Seeing Eye of God as the symbol of divine watchfulness, and the words BROTHERLY LOVE, RELIEF & TRUTH that the order considers its foundation, along with FAITH, HOPE, CHARITY, emphasized in a Mason’s First Point Ceremony, all in raised 24K gold relief against a background of classic floral engraving. On the right side, black and white mosaic squares represent the floor of King Solomon’sTemple to illustrate “human life, checkered with good and evil.” Ascending stairs remind a member of the path to higher levels of Freemasonry, with another “G” at the top as the ultimate goal. It’s built with the same smooth action that all rifles in Henry’s award-winning Golden Boy family are known for. 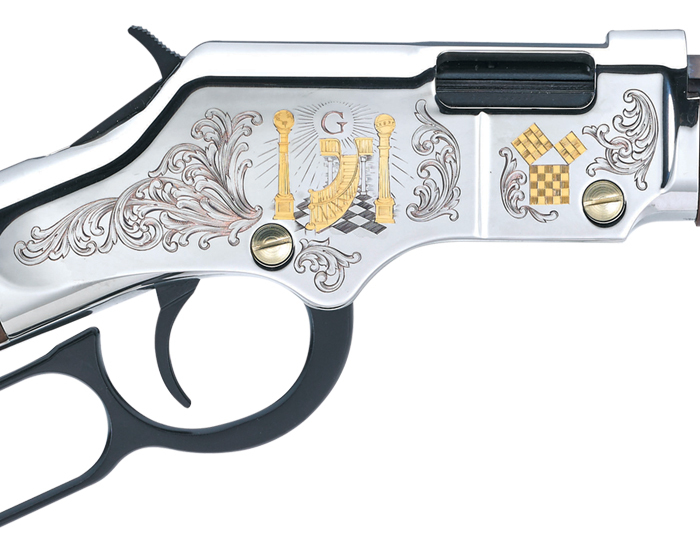 This model features a nickel-plated finish and the receiver engravings are plated with 24K gold. The buttplate and barrel band are brass. The American Walnut stock is engraved and hand-painted. It features a fully adjustable semi-buckhorn rear sight with a reversible white diamond insert and brass beaded front sight. It includes a blued octagonal barrel and is drilled and tapped for easy scope mounting. Offered in caliber .22 S/L/LR, capacity is 16 rounds of 22 Long Rifle and as much as 21 rounds of 22 Short. Model H004MAS is available through licensed Henry dealers. MSRP $1200.00. 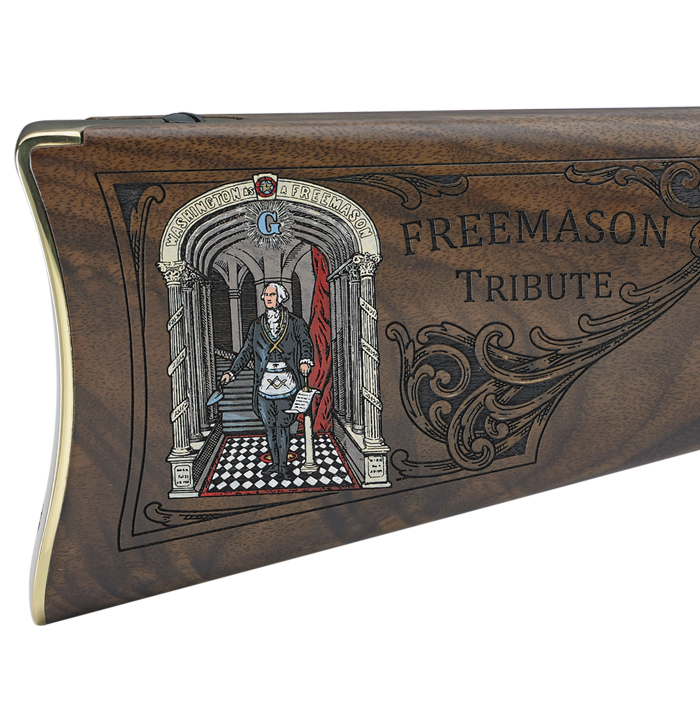 For more information and product images visit Freemasons Tribute Edition Rifle or call 201-858-4400. To review the entire line of Henry rifles please order a free catalog by calling 800-504-4731.